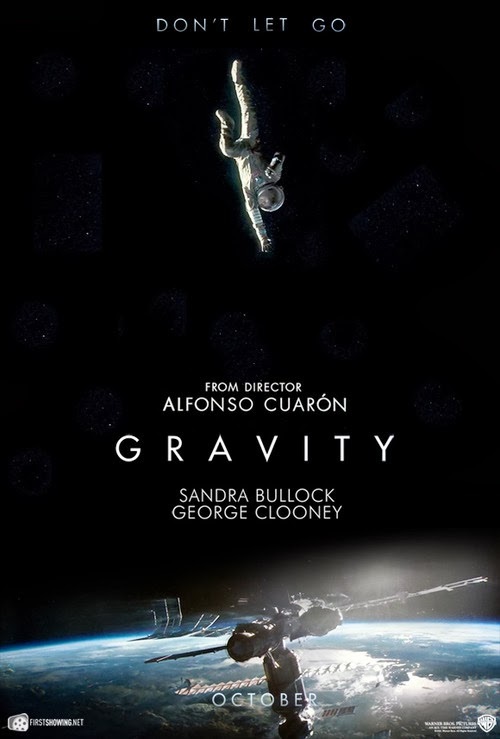 Thoughts Arise: Suspension of Disbelief and the Matter of "Gravity"
Suspension of Disbelief and the Matter of "Gravity"
Spoiler alert - This blog post contains spoilers about Alfonso Cuarón’s film Gravity. Science fiction films by their nature invite us to suspend disbelief. They are vehicles of the imagination, often asking us to buy into improbable or impossible situations. But is there any way for us to assess when their flights into counterfactuality are justified and when they go too far? "Unfortunately, with all this verisimilitude, there is a hole in the plot: a gaping orbital impossibility big enough to drive the Starship Enterprise through." According to Overbye, this hole gapes because the film asks us to suspend disbelief and accept as a premise that the Space Shuttle on a Hubble Space Telescope servicing mission and the International Space Station (ISS) would find themselves in the same orbit, indeed within spitting distance of one another. (It should be noted that, thanks to the aforementioned Newton’s laws, spitting distance in the vacuum of space can be considerable.) Overbye may be right as a matter of history, but I believe that he is wrong as a matter of film criticism. And, contrary to his expectation, I don’t think that “space fans will groan” as result of Gravity taking this liberty. When a film like Gravity asks us to buy into something that we know is unlikely or out-and-out untrue, it does so as part of a bargain. In exchange for our credulity we are promised a compelling story, with the understanding that the impossible or improbable things that we are asked to accept are essential to the tale that is to be told. Whether these whoppers are large or small or whether they numerous or few, they cannot be arbitrary; they have to be critical to the development of place or plot or character in some important way. Like any work of fiction, Gravity enjoys moderate license to play fast and loose with historical facts. We don’t complain, for example, that its story is impossible because the space shuttle program has come to an end and all surviving instances of that spacecraft have taken up final posts in museums around the country. Nor are we much bothered by the fact that, even if the space shuttle remained operational, it would not be dispatched on another Hubble repair mission. Getting the funds from Congress and a “go” from NASA for the last one was a was a near impossibility. 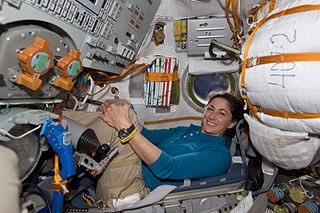 poses in a Russian Soyuz spacecraft. In exchange for these lapses in historical authenticity we get a plausible space adventure, one which begins with a breathtaking, yet oddly familiar, establishing shot: our protagonists, rookie Mission Specialist Dr. Ryan Stone (Sandra Bullock) and veteran astronaut Matt Kowalski (George Clooney) space-walking in the vicinity of an orbiting space shuttle and the attached Hubble Space Telescope, floating against the backdrop of a beautiful, blue, cloud-dappled Earth below. Significantly, this opening scene tells us that director Alfonso Cuarón intends to anchor Gravity in a faithful recreation of contemporary space technology; this movie is not going to be some sort of fluffy sci-fi contrivance filled with make-believe spaceships decorated with bogus control panels. Instead, what Cuarón has in mind is a painstakingly realized period piece, the period being the second decade of the twenty-first century and the setting, the human outposts of low Earth orbit and their surrounds. The tale that Cuarón has to tell here is, in part, an age-old one of survival against all odds, the triumph, by grit and cunning, of a hapless and isolated wayfarer over the unforgiving forces of nature. Traditionally, stories like this unfold at sea. (Take for example Ang Lee’s Life of Pi in 2012 and Robert Redford’s soon-to-be-released All is Lost.) For centuries our planet’s vast oceans have provided storytellers with the ready possibility of total isolation. Menace in these circumstances is usually delivered in the form of raging storms from above or man-eating predators from below. And, of course, there is the inevitability of death, if food or water should become exhausted. In Cuarón’s reimagining of this genre, the deep blue sea is replaced by a transparent, airless region of space two hundred miles or so above the surface of the Earth. Vacuum and extreme temperature are the the ever-present predators here, kept at bay by the thin white line of spacesuit and the thin gold one of visor. An expanding cascade of high-velocity space-debris destroys all possibility of communication with Mission Control, drawing the curtain of isolation tightly about our astronauts. To make matters worse, this very same storm of orbiting shrapnel rains down like clockwork every ninety minutes, growing in intensity and destructive force with each circling of the planet. Minutes count. There will be no ticking off the passage of days by anyone with marks on the side of a life raft. Eventually Ryan’s isolation is made total as her partner Kowalski drifts off into the void at the end of the first act of the film. In this environment, hunger and thirst aren't killers; death comes quickly when oxygen runs out. This is where Overbye's objection about the location of the International Space Station so close to the Hubble comes into the picture. Having stranded his hero, Cuarón is obligated to provide her with a way home. He must do so while remaining faithful to his artistic vision for the film, which means staying true to a recreation of contemporary space technology. So, in defiance of historical fact, the director places the Space Station nearby the orbiting Hubble telescope. It will provide Ryan with a temporary place of refuge and the possibility of using the attached Soyuz spacecraft as a lifeboat to ferry her to Earth and to safety. It will also provide the director with the opportunity to demonstrate his virtuosity at bringing this beautiful and intricately constructed space habitat to life on the screen. 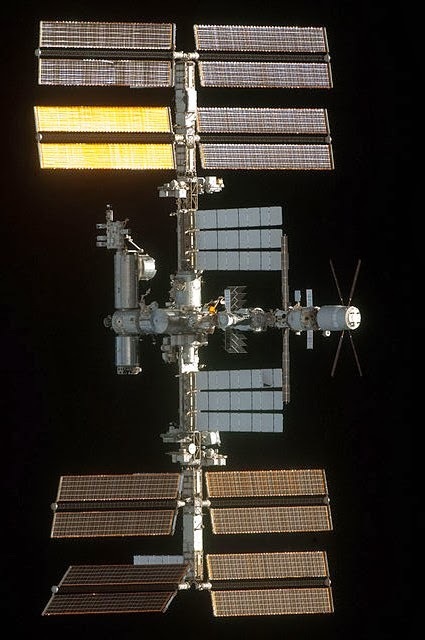 Allowing the Space Station and the Hubble to share the stage in Gravity is a concession which permits the director to relocate the traditional shipwrecked survivor tale to low Earth orbit. The story must supply some way for Ryan to save herself. Using the Space Station seems a reasonable choice, given the artistic restrictions that Cuarón has imposed on himself. 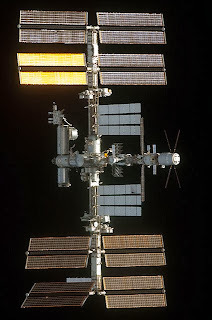 In addition, we are rewarded as a result of this choice by a display of CG verisimilitude that is all the more compelling because it is rooted in detail that can be found only in existing engineering marvels such as the International Space Station. This bargain offered by Gravity was more than enough to meet my criteria for suspension of disbelief. I willingly accepted its premises and, thanks to Alfonso Cuarón, got a plausible and compelling tale of triumph against all odds in return.